If British wood products company Ronseal were to lend their well worn tagline to a brewery for a beer, they'd no doubt give this new draught only release from Dainton lengthy consideration. While they liked to declare that their wood stain "does exactly what it says on the tin", it's fair to say that this beer "does exactly what it says on the decal". Well, the bit about Choc Orange, at least. It's fair to say that the rich, dark brown drop is eminently chocolatey and even more orangey. They reckon it tastes like a "liquified, boozed up Jaffa Cake"; we'd suggest it's even more into Terry's Chocolate Orange territory, albeit outdoing even that foil-wrapped stocking filler in the choccy orangey stakes. If you haven't cottoned on yet, what we're hinting at is that this beer is a sweet, after dinner treat type affair that will appeal to fans of chocolatey porters, candy orange and, especially, chocolatey, candy orange porters. To those of you who fall into that category, you can thank Dainton's own band of acolytes as they chose it in a Facebook vote last year. 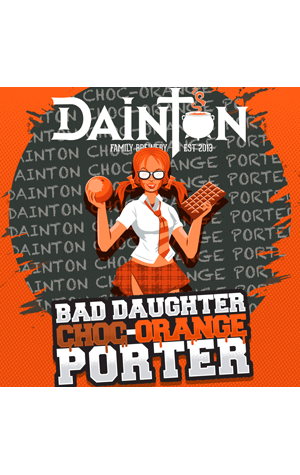 It's based on an old homebrew recipe of Dan Dainton's, features specialty chocolate malt, uncracked wheat, orange zest and (possibly) a slight addition of Jaffa lollies. It first hit a bunch of taps during Good Beer Week 2016 and will be appearing on a few more afterwards.